As we all know by now, AIG wrote hundreds of billions of dollars worth of credit default swaps that it now has to make good on. And since the U.S. government has bailed out AIG to the tune of $150 billion or so, that means that taxpayer cash is being used to pay off a lot of those bad bets. 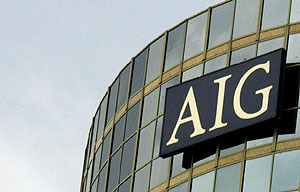 As the Journal notes, the payments arise because AIG has to post collateral every time the bonds it insured take a hit….That’s scary, because as the economy continues to deteriorate, all those bonds AIG insured are going to keep deteriorating, too, and AIG will have to keep posting collateral. Which means the taxpayer, assuming we don’t let AIG collapse, is going to have to keep forking over cash. It does seem like it’s time to start triaging here. That is, the government needs to start figuring out which financial institutions can afford to get stiffed by AIG (by which I mean which ones won’t go under if they get stiffed), and start stiffing them. You obviously want to do it in a careful and orderly way so as not to freak out the financial markets. I’m open to persuasion here, but this actually sounds like the worst possible way to address the counterparty problem. Our dilemma, as Scheiber implies, is that if AIG’s counterparties don’t get paid, some of them might go under themselves, and then we end up with a cascade of bankruptcies. But his solution is a cure worse than the disease. Do we really want the U.S. government deciding that certain counterparties get paid and others don’t, and doing it on the fairly arbitrary basis of stiffing the ones it thinks can best afford to be stiffed? Not only does this send precisely the wrong signal — if you managed your investments well you’re first in line to get shafted — but it’s practically guaranteed to be unfair. Do U.S. counterparties get preference over foreign counterparties? Does payment depend on who fibs the best about their financial condition? Do we really want to prop up our worst banks in such an opaque fashion? If we’re going to do that, shouldn’t we just do it honestly and either give them money outright or else nationalize them? A better way, surely, would be to figure out a way to pay off creditors based on class. The most senior can expect 90 cents on the dollar, others will get 80 cents, and some will get nothing. Or maybe everyone gets paid off in full. But in any case, everyone in each class gets the same deal. This is a system everyone is used to from ordinary bankruptcy proceedings, and it’s generally viewed as fair and equitable. Surely that’s the way to go if you don’t want to freak out the financial markets.